These plates are manufactured in China but decorated in Delft. In contradiction to the name the application of the Amsterdams Bont design was mainly done in Delft. 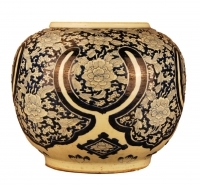 The Kakiemon style is an exceptional European imitation of a typical Japanese decoration with figures. This design is to be found on Arita porcelain from around 1690-1710 and depicts a woman who is listening to a nightingale. These plates show the elaborated version with an additional male servant. The design with the lady and the nightingale was very popular through the entire 18th century and was also used in England (Chelsea) and France (Chantilly). Chelsea used the pattern around 1750 where it was known as ‘Lady in the pavilion’ or ‘old lady pattern’. H. Espir, European Decoration on oriental porcelain 1700-1830, p. 85, noot 12.